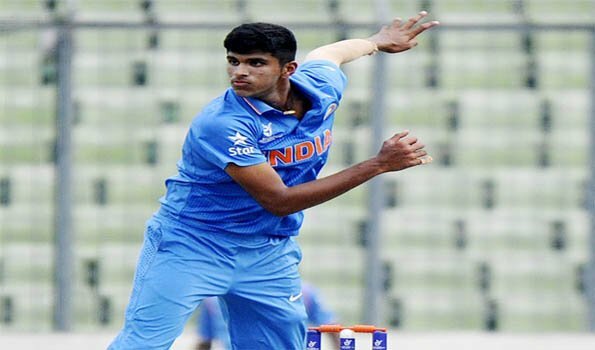 Colombo: Indian spinner Washington Sundar who had helped the team to win against Bangladesh and reserve its birth in the final expressed hope that with this performance, Indian Team can easily win the tournament.India have ensured their place in the final T20 series after defeating Bangladesh by 17 runs in their last knockout match on Wednesday. Sundar was the most successful bowler who took 3 wickets for 22 runs. On the other hand, captain Rohit Sharma, who has been out of the previous several matches, became man of the match due to a half-century of 89 runs. While briefing media after the match, Sundar said," I am happy with my performance where, i am have bowled with an impressive economy rate and also successfully took wickets. Chalal and me both bowled with an impressive economy rates""It's not easy to defend any score on this wicket. We have already seen that Bangladesh had managed to chase down big score of 215 here. In such a situation, our plan was to focus on the economy". he added.The 18-year-old spinner sent Tamim Iqbal, Liton Das to the pavillion and strengthened the position of India by taking wickets of all the three opening batsmen of Bangladesh. Other important spinners, Yuzvendra Chahal also got a wicket in the middle order. So far, Sundar have managed to take seven wickets in the series and his economy rate has also been quite impressive. Commenting on to bowl in the powerplay, he said, "When you are leading Indian team, then you have to be ready for all the challenges. Bowling is always difficult in the powerplay, but this is what happens in cricket. When you face the challenges, you get satisfaction too". The young all-rounder has bolwed 11 out of 16 powerplays in the tournament and it has proved himself to be very useful for the team during this period. He said, "I'm lucky that I have this talent. The opposing player tires to hit six on each balls, so it is necessary to stop them. I also bat and can clearly understand, the physcology of the batsman".